The other day my family and I went to a local animal shelter, my daughter wanted a cat. There were lots of cats, many dogs and throngs of people huddled near the front desk waiting to hear their name regarding the joyful sound of acceptance at being the newest recipient to adopt. My wife and daughter went in search for the perfect pet and left me behind to fill out the paperwork. As I struggled with the in-depth questions about my stability and readiness to take on this “awesome” responsibility, the loudspeaker gleefully announced a name and proclaimed that they were the newest adopters. The crowd clapped and the applause started and I looked up dumbfounded by the entire process. Let’s put these events into context. As we arrived at the adoptions/ housing facility the building was modern and was a far cry from the rusty cages of animal shelters of my youth. This was not the Humane Society but a private enterprise that “preserved” the sanctity of the animals within. The floors were pristine and polished tile or prepared and sculpted surfaces that were clean and shiny. Behind the washed glass of each room, the animals played or slept or woefully waited for their chance to be discovered and adopted. There was an air of anthropomorphism as each potential pet was elevated to almost human like standards, culminating with a contract of responsibility called an adoption. What struck me as odd however was not in the process but in the facility and with the opulence measured out in abundance toward the creatures within and the comparative reality that in many parts of the world these same animals are a necessary food item. The luxury of even the idea of a pet is often a temporary condition placed on an animal only until his time to feed the family oversteps his familial connection. One day you're playing with the dog and the next it’s your breakfast, lunch, and dinner if there is enough to go around. We did adopt a small, little cat and no we do not plan to change its status just because I get hungry for a snack. But when you look at what we spend on our pets in relation to how many of our worlds children live and survive without even the benefit of dog or cat food, we may then be able to put into context the waste of our efforts to save these wonderful creatures but forsake the human children around the world. I tried to imagine the joy those children would feel if they were somehow transported into what we call an animal shelter, or even many of our own inner-city youth being offered the accommodations that we provide these lost, forgotten and abandoned animals. And then I thought, is this what society has become? Is this a measure of our humanity when we build and construct apartment like facilities to house the innocent creature but fail to raise our own kind to at least that same level? After these thoughts, I told the proctor to forgo our announcement of adoption and to not create the party like declarations. “you don’t want me to announce your union with your new addition?” she asked incredulously. “No!” I answered. “This is a private affair”, I added with a sincere tone in my voice to belay the feelings of disgust I was having over the entire process. I need to clarify a few things here. I am not against taking in pets and in fact, I think we, as a nation, should be more responsible in how we manage our pets and forgotten animals. What I am against is the displacement of our priorities and the implementation of the word adopt as if in the word alone we would open our eyes and recognize those responsibilities when in fact we have only marginalized the importance of the word “adopt” and moved it away from its true meaning in relation to our human family and our connection with each other. It is estimated that we spend more than 60 billion a year on our pets. I’m not sure of the breakdown of those numbers but 60 billion is a lot of money, especially when there is an estimated 1.65 million in the United States who live on less than $2.00 per day. There are approximately 50 million in the US that are considered poor, I do not fully understand what being poor means in our dynamic and service filled economy but that is the reported number. However, you want to justify what you spend on your pet those numbers are disturbing. I can’t even imagine the numbers of poor and desperate from a worldwide perspective, numbers that when understood would alter our perception of hope and shatter our reality of what being a human is all about, but they are real, mostly ignored, so we can continue to live our lives without the burden and associated responsibility. 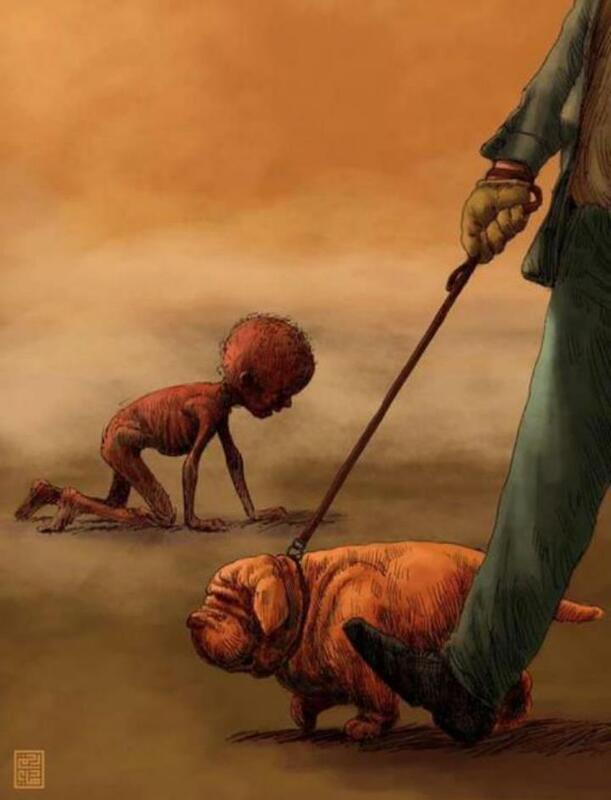 I wonder, how many would offer their pet for life-saving food to a desperate child in need? Just a question to think about and while I’m asking, what’s more important, your pet or the life of a real, breathing human being? Tough questions? Perhaps, but do we have the political will to do what's right? Do we have the heart to sacrifice what we have become to alter our perception in order to balance the needs of not only this country but of the world? Our cat is still very small and not worth much from a dietary standpoint but would I offer my daughters pet? Let's hope we can find a better way.